Combine the dressing ingredients in a small bowl, gradually whisking in the oil until it has emulsified. Put the steaks in a shallow dish, pour 3 tablespoons of the dressing on top, and turn to coat them evenly. Allow them to stand at room temperature for 20 to 30 minutes before barbecuing. Set aside the remaining dressing. 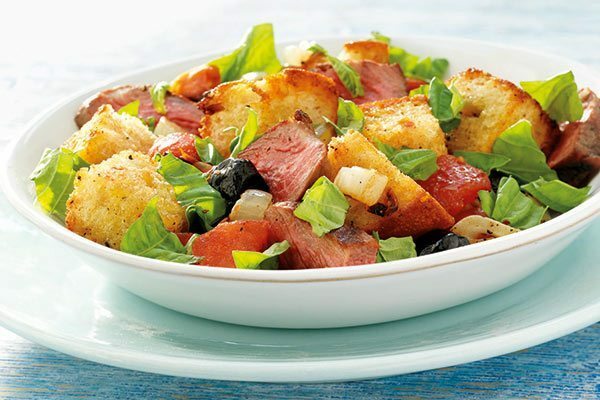 Put the bread cubes into a large bowl, add 2 tablespoons of the dressing and toss to coat them evenly. Thread the bread cubes on to skewers. Brush the cut sides of the tomatoes and the onion slices with 2 tablespoons of the dressing. Prepare the barbecue for direct and indirect cooking over a high heat. Brush the cooking grills clean. Barbecue the tomatoes and onions over direct high heat and the bread skewers over indirect high heat, with the lid closed as much as possible, but turning as needed, until the tomatoes are lightly charred, the onions are browned and the bread is toasted. The tomatoes will take 2 to 4 minutes and the onions and bread skewers will take 6 to 8 minutes. Remove the food from the barbecue as it is done. direct high heat, with the lid closed as much as possible but turning once, until cooked to your desired doneness, 6 to 8 minutes for medium rare. Remove from the barbecue and let rest for 3 to 5 minutes. Pull off and discard the tomato skins. Cut the onion, tomatoes and steak into bite-sized chunks, then place in a large serving bowl. Add the remaining dressing, olives, bread cubes and basil and gently mix. Serve immediately. Toss big cubes of dense bread in salad dressing for flavour and even browning. Skewer the bread cubes to make them easier to handle on the barbecue. Firm but ripe Roma tomatoes maintain their shape even when you lightly char them. Barbecuing the bread cubes over an indirect heat allows you to brown them slowly, with little risk of burning.